We just saw a hilarious skewering of the food world at L.A.’s U.C.B. 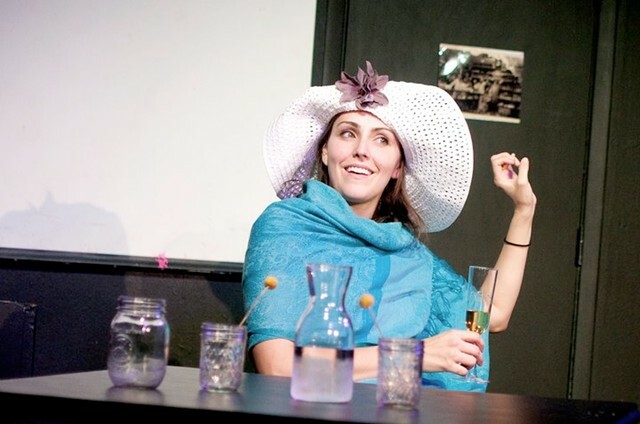 (Upright Citizens Brigade) called “Pig: A Restaurant.” Actress Lauren Adams tackles everyone from Gael Greene to David Chang in this play written by Leila Cohan-Miccio and directed by Caitlin Bitzegio. Based on real world food experiences (Leila ran the blog Grub Street and Lauren worked at Balthazar and D.B. Bistro Moderne), the show imagines a Brooklyn restaurant called Pig: A Restaurant where the hostess answers the phone “This is Pig: A Restaurant, I’m Aurora: A Hostess.” Like most hip restaurants nowadays, every dish there is made with pork (to the chagrin of the owner’s dead husband’s kosher-keeping parents) and the signature drink is a Brooklyn (“which is the same as a Manhattan, except you drink it in Brooklyn.”) The show flies along at a clip and for anyone with passing knowledge of the food world (at the opening night party, Thomas Keller is turned away because he’s “not on the list”) you’re bound to appreciate the knowing, wicked humor of these very talented restaurant industry vets. And if you’re in L.A. you’re in luck: there’s another show on February 2nd at 7 PM. (There are also more shows in New York on 2/6 and 2/20). Go see it; you’ll laugh, you’ll cry, you’ll crave pork belly. It’s Hard To Look Good While Eating….